Chocolate Stout Beer Bread – Again! Okay, I think this time I’ve finally made enough beer bread. I’ve probably made enough to choke a horse at this point, but I think I’m actually done now. 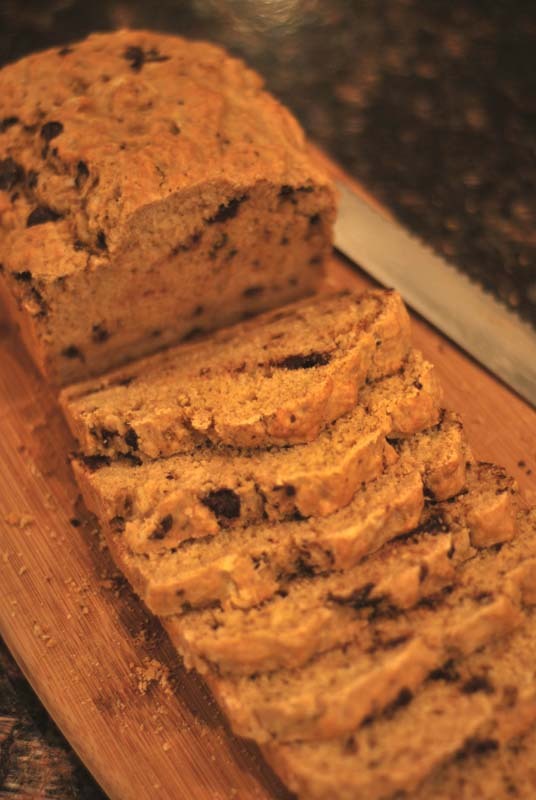 For the year, anyway; beer bread will always have a cherished spot in my recipe book! You may remember the beer bread variations I did a few weeks ago. One of those variations, the chocolate stout one, didn’t exactly turn out as I’d hoped. The result was very much like an undersweet chocolate cake – not exactly a bad thing, but not what I was going for. Of course I had to have another crack at it! Previously, I had added the chocolate into the batter by sifting cocoa powder in with the flour. The idea was to get a more even distribution of chocolate flavor, which is exactly what happened. Unfortunately, the crumbly, moist nature of beer bread, reminiscent of a savory cake, rendered that approach a little too dessert-y. Not to mention, the stout flavor was totally obscured by the pervasive cocoa. This time around, I opted to simply mix chopped chocolate into the batter instead. This turned out to be a far better solution, as the bits of chocolate flavor the bread while not obscuring the stout flavor. Speaking of which, the stout flavor was significantly mellowed. To be fair, I didn’t use the darkest of beers (and technically, it wasn’t even a stout, but hey hey), but the bread itself took on a quite pleasant caramel, brown-sugar flavor and color. I imagine a Guinness or any other proper stout would lend a welcome bitter note that would pair nicely with any type of chocolate, even a quality milk chocolate. You could always use my almost-bought-it second choice, Young’s Double Chocolate Stout, which comes in pleasing over-12-ounces sizes (what will I ever do with those extra ounces? ), but which possibly maybe crosses over into too-good-to-cook-with territory. It’s a fine line, that. Other than the chocolate formatting change, everything else remains the same as in the first attempt at chocolate stout beer bread, most notably the use of olive oil instead of butter (as in the original, plain beer bread). To my slight dismay, the olive oil flavor doesn’t really come through; but I will say that this bread tastes just fantastic when toasted and dipped in olive oil. Maybe not as supremely amazing as this chocolate bread dipped in olive oil, but still pretty great. Crumbly, crusty, chocolate-y, this bread covers most of the bases. Hope you enjoy it – this one’s a keeper for me! 2. In a medium bowl, whisk together the flour, baking powder, salt, and sugar. Add the olive oil and beer, and stir with a spoon or spatula until mostly combined. Add the chocolate, and fold together until just combined, and all dry ingredients are moist. Pour into prepared loaf pan.